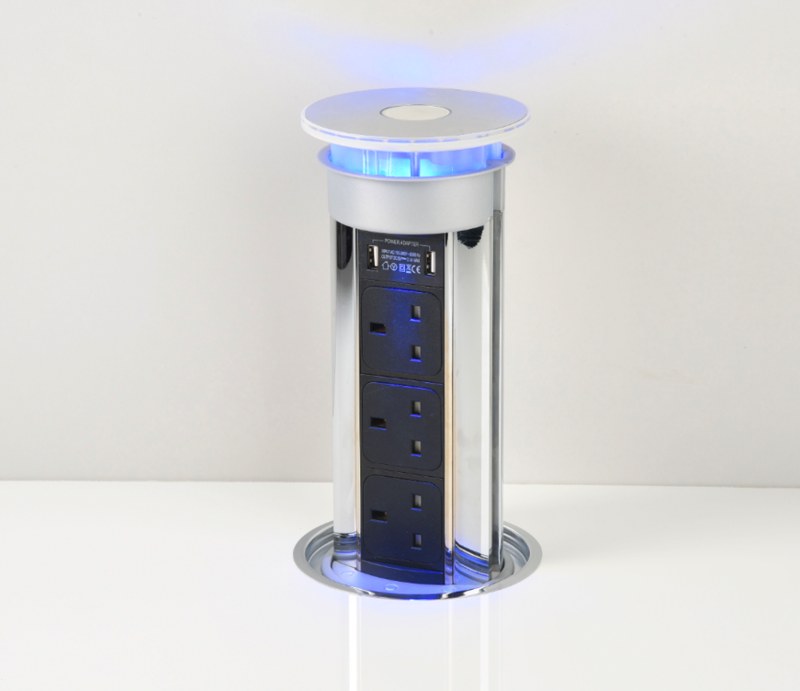 100mm Diameter Pop Up Power Unit with 3x UK Power Sockets & no Data Ports. This particular model comes with extra features, such as USB Ports and LED. Just peel back the protective film and drop it in a predrilled hole ready to go. Supplied with a standard 2 metre lead and fitted plug for any UK Standard 3 pin socket - just like an extension socket! The Bright Chrome Top Disc compliments the Two-Tone Black & Chrome surround and you just depress the button to 'pop-up' the unit about 25-30mm - and then draw it into position. Adds that real wow factor to any kitchen, especially when used in conjunction with the flush fit adaptor ring, now supplied as standard! This unit is predominantly manufactured from a quality Zamak (Metal) material and will enhance any kitchen, workspace or prestigious development, where power or data distribution is required. As with all our concealed sockets, we always recommend you get a tradesperson to install this unit. Sadly had to return these sockets as our kitchen build changed in the first week so we had to resort to conventional wall sockets, shame as they are a nice bit of kit. Excellent will be buying again. 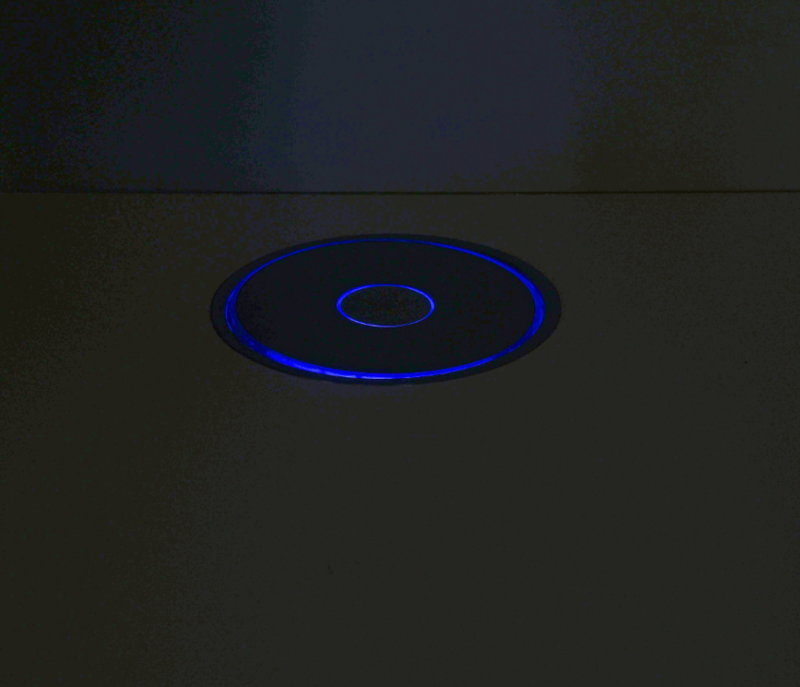 I saw one of the reviews mentioned the colour of the button but I put this unit into my corian worktop, which is actually a white colour with grey flecks and the button looks great, as it really picks out the worktop! Saying that though, even if I had a black worktop, I think the two-tone contrast would work equally well and anyway, it's the chrome that really grabs your attention! We've had 2 of them installed now for 3 months and the buttons still looks a nice white colour, exactly the same as when we fitted them. Also, this is the only product of this type we could find on the market that sits completely flush into the worktop which is a really nice touch! All in all, a very happy punter! great product - pity they were let badly down by their delivery company UPS. I paid extra for next day delivery and had my installer arrive - but by 6pm no goods. they turned up two days later. Thanks for your positive review of the product and apologies for the trouble you had with UPS. We're dedicated to ensuring all orders leave our warehouse in good order and on time but obviously appreciate that we're ultimately responsible until goods arrive at our customers door! To achieve this, we deliberately work with industry recognised companies such as UPS, to help us deliver the best service possible. So again, I'd like to apologise on their behalf and having just looked into it, I understand our customer service team is already following this up on your behalf with UPS, so we hope to have a response from them shortly as to what happened in this instance. In the meantime, I understand we've already arranged to refund you the overnight element of the order and will work with UPS to ensure they offer our customers the high standards of service we normally can expect from them! A nice item but disappointed with the centre "pop up" button. This is in a cream coloured rubber that looks permanently dirty. Should particular part (as on permanent display) should be better for the price in my opinion. 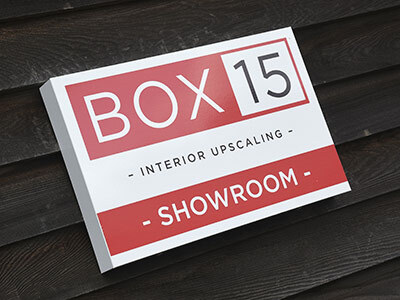 Response from BPF WebSales : Thanks for your positive comments and regarding the colour of the button to activate the pop up feature, all the LED range come supplied factory fitted with this white/cream button. The standard range (without LED) comes with a Black button as standard. I think they've just tried to differentiate between the ranges with the button colours, but I will put forward a suggestion to the factory that this is made an option so customers can decide what best suits their worktop. I will also ask in the meantime if there's a recommended cleaning product, that you can use to clean that rubber button as I'm sure there must be some way to clean fingerprint marks. Q: Is this suitable for kitchen worktops (approx 1/2 Metre) from a sink. What i'm trying to say is it waterproof? A: These Milan pop up sockets are all IP54 rated but must still be installed as per standard building regulations relating to electrical sockets distance from a water source. Hopefully your tradesman / fitter would no doubt be aware of the most recent regs. I hope that helps. Kind Regards, The BPF Web Team. Q: Hello - what clearance is needed beneath? I am thinking of putting above magic corner wire but worried will catch? How are they installed electrically? Q: Can the socket be turned to the left and right once it has popped up? A: Not really no because it's clamped to the underside of the worktop with a large shoulder washer to keep it stable - so that would prevent it from being turned. You can obviously slacken that off from the underside to rotate it but it's certainly not designed to rotate around once it's been installed I'm afraid!